Then, Jennifer gave Jackie Goldschneider a Turkish knife to “stab her in the back”. Yes, this is about that article Jackie wrote about “spoiled children” after she left Jennifer’s home with its sixteen bathrooms. Tonight’s Real Housewives of New Jersey episode is a dramatic one for Jennifer Aydin. She gives Jackie Goldschneider a souvenir from Turkey. No, it’s not a peace offering. Instead, it’s a passive aggressive gesture in retaliation for the article Jackie wrote about spoiled children. Jennifer gives her an ancient Turkish dagger to “stab people in the back.” Did she just realize that she has to make some waves to get a callback for a second season? After bragging about her Paramus mansion for too many episodes to count, Jennifer amping up the drama tonight. Jackie isn’t the only Housewife she fights with. Last night’s episode of Watch What Happens Live was chock full of shade. Danielle Staub (shockingly) owned up to her bridezilla antics. 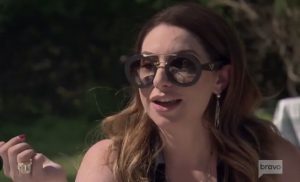 Lindsay Lohan’s Beach Club namesake Lindsay Lohan talked Real Housewives and her rumored hook up with Jax Taylor. Host Andy Cohen was loving every second of it and so was I. Last night was all about family values as Jennifer Aydin returned to Turkey to celebrate her brother’s engagement. THen, Teresa made amends with Jackie Goldschneider. 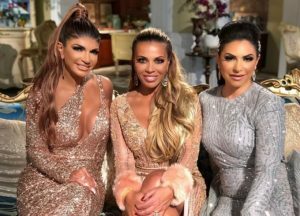 The tension has been building between Teresa Giudice and Jackie Goldschneider all season long on Real Housewives of New Jersey. Jackie took Melissa Gorga’s side in her argument against Teresa and had the nerve to acknowledge that Joe Giudice is in jail instead of “away” or “at camp” as they like to say. On tonight’s Real Housewives of New Jersey episode, Teresa and Jackie finally have their one-on-one sitdown. Will it go well? Probably not. It’s very likely that their non-issues will continue all season and into the reunion, guaranteeing a Season 2 for Jackie.